Today’s vote ends the PUC process and allows pipeline opponents to sue in court to stop Line 3. Several groups already have announced their intent to sue, including the Youth Climate Intervenors. The large contingent of pipeline resisters chanted their disapproval after the vote, causing a visibly angered PUC Chair Nancy Lange to gavel the meeting to order. (Didn’t work.) Pipeline opponents walked out of the meeting, held a rally outside the hearing rooms, then marched to the Capitol to talk to Gov. Tim Walz’s transition staff, sharing the many reasons people oppose the pipeline. 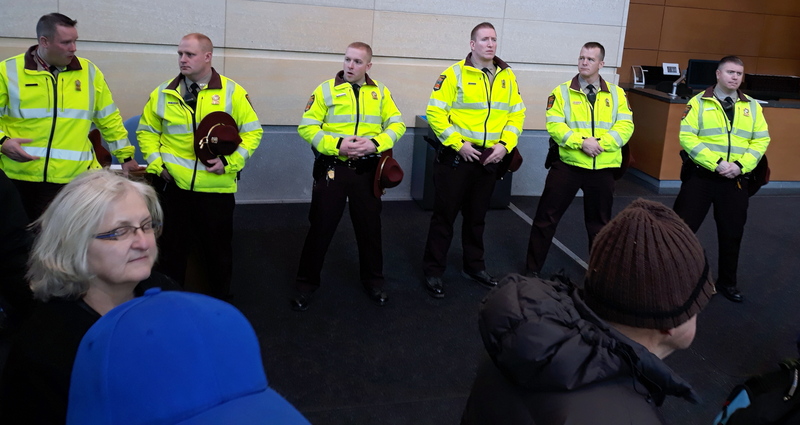 A heavy security presence was clear as soon as people entered the Minnesota Senate Building. Sen. Patricia Torres Ray and a few other elected official were present. 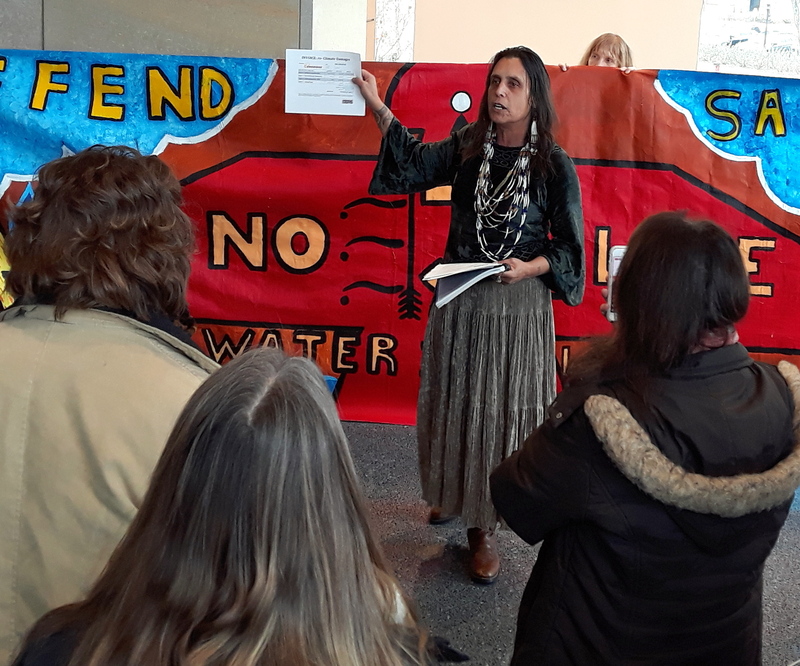 Torres Ray was upset that a PUC staff member was barring Winona LaDuke, executive director of Honor the Earth, from the hearing because of space. Torres Ray said LaDuke was an important voice on this issue and she personally intervened to get LaDuke seated, she said. Torres Ray’s concerns extend beyond that particular incident. She personally counted 42 Capitol Security cars in the Senate Building parking lot, and that’s not counting security cars parked on the city streets. She believed the number of security personnel outnumbered the number of pipeline opponents, she said. We are building a system of exclusion and restriction, particularly on Native people and People of Color and young people of color, and it is just incredibly upsetting to me. … We need to do the opposite — open the door. 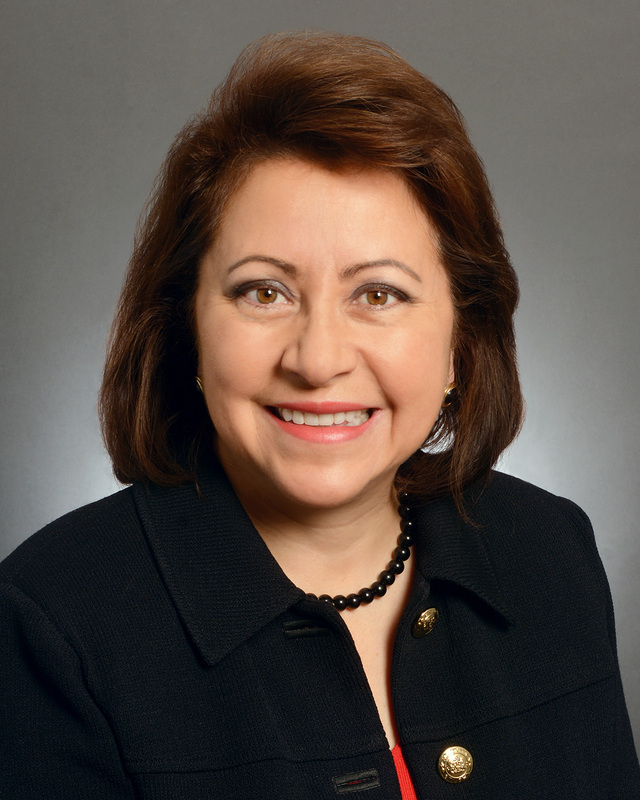 Torres Ray plans to talk to Senate leadership to find out how these kind of rules are put in place and what kind of training Capitol Security receives to deal with such large crowds, she said. Winona LaDuke holds up an invoice for climate damage from The Creator to Enbrdige. Speakers at the rally continued to raise the issues that they have been raising for years. LaDuke came with a $266 billion dollar Invoice for Climate Damages from The Creator to Enbridge. The bill included line-item costs for the release of carbon, the destruction of forests, the destruction of wetlands, and all the social costs of climate destruction to global citizens. The resistance will continue on many fronts, in the courts, in the streets, in the pulpits and prayer camps, and in conversations with the incoming administration of Gov. Tim Walz and Lt. Gov. Peggy Flanagan. Here’s just a few updates. 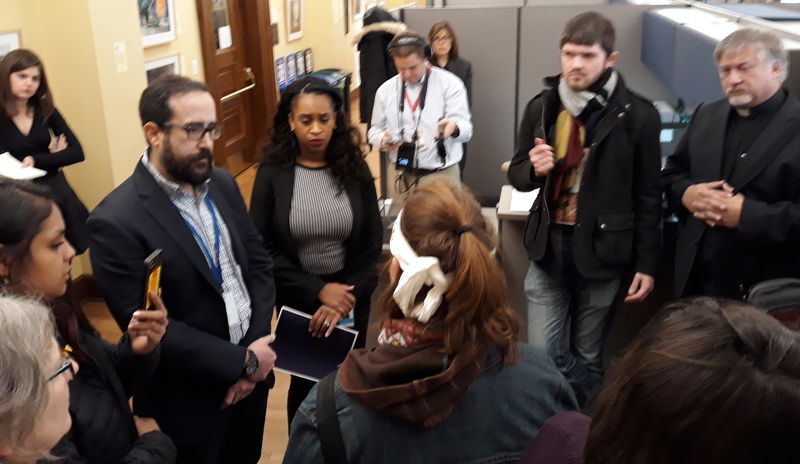 Julia Nerbonne, executive director of Minnesota Interfaith Power & Light (MN IPL), reminded people about the 550 faith leaders who signed onto a letter to Gov. Dayton and the PUC expressing their opposition to Line 3 on moral grounds. “Congregations are continuing to have conversations across the state, especially along the pipeline route,” she said. If you are part of a faith community and want to work on Line 3, consider connecting with MN IPL. Line 3 still needs to secure more than two dozen state and federal permits. Efforts are underway to make sure the environmental regulations on the books are held to the highest standards. Several environmental groups are hosting an education event “We Can Stop Line 3” on Saturday, Dec. 8, 1-3 p.m. at the CWA Local 7200 Hall, 3571 East Lake Street, Minneapolis. Come and figure out how you can best support the resistance. Over the last 11 years that I’ve lived in Minnesota, I have attended many PUC meetings, frequently leaving with a sense of anger and disgust. At the same time, various NGOs, including Sierra, were legitimizing the PUC, encouraging people to “trust the process.” Now, people need to pressure Walz to get rid of these commissioners and replace them with commissioners with some loyalty to the people and the future. Will it happen?